Rodeo Stampede is as addicting as Crossy Road. And I must confess I have never played anything like this before. I just cannot stop playing this game. With every new animal I capture, my curiosity increases, pushing me to explore more regions and keep collecting new and rare animals for my Sky Zoo. At one point, your lassoed animal will become extremely irritated and try to buck, throwing your cowboy on the ground. When you see a red exclamation mark above an animal, better lift your finger to let your cowboy jump and catch another animal. Don’t forget to touch and hold to lasso when the circle moves toward an animal. Each animal behaves differently when angry. Buffalos will buck, but won’t throw the cowboy immediately on the ground. But elephants may do so, and they get angry very quickly. So if you are riding an elephant, lift your finger up immediately when you see the red exclamation mark. You may even try to eject your cowboy before the exclamation mark appears. When ostriches get angry, they don’t buck. They run fast. Very fast! You can actually take advantage of an ostrich’s speed if you want to break your previous record or explore uncharted lands. You can ride the ostrich after the red exclamation mark appears but at one point you might get a bit dizzy and the screen will become a bit blurry, and this is where she can become uncontrollable. All animals have different traits. Elephants will run slow, but can smash anything, except big rocks, that come in his way. Ostriches run pretty quick, so do zebras. Buffalos take time to buck so you can ride them for a longer period of time. Upgrading the Zebra habitat at level 5 will make angry zebras buck less violently. At level 6 any nearby zebras will move toward your cowboy’s lasso when he is in the air. Leveling up the buffalo habitat to 3 will make it charge forward slamming anything on its way when your cowboy lands on it. At level 2 and 6, you get to ride the buffalo for extra 2 and 1 second respectively before he gets angry. Upgrading your Ostrich habitat to Level 5 will make speedy ostriches throw you if you crash, giving your cowboy a chance to lasso another nearby animal. If you upgrade elephant habitat to level 5, elephants can smash other elephants. At level 3, elephants can smash through rocks. Check the levels and upgrade benefits of each new habitat to know how upgrades can affect their behavior. By now, you may have known how to tame an animal. You touch and hold to let the cowboy ride an animal. To move, you will have to drag your finger left, right forward or backward while keeping your finger pressed on the screen. When you want to jump to another animal, you lift your finger. To lasso an animal, you will have to wait until the dotted circle moves towards an animal. This is when you touch the hold the screen so that the cowboy catches the animal. However, it’s up to you to decide when to jump from one animal to the other. It also depends on the animal you are riding. If you are riding a buffalo, you can wait a few seconds after the red exclamation mark appears. The buffalo won’t throw your cowboy up in the air immediately after he starts bucking. But, the elephant will. Ostriches will run much faster when they are angry. To be on the safer side, I would recommend jumping from one animal to the other before an exclamation mark appears, especially if you want to go a long way, beat previous distance or explore more. Just make sure you don’t lift the finger if there are too many obstacles or a big group of animals running along a narrow ravine. Be careful when riding the elephant as it get angry quickly, so after riding for a few seconds, try to jump to a nearby animal as soon as possible to avoid being thrown on the ground. 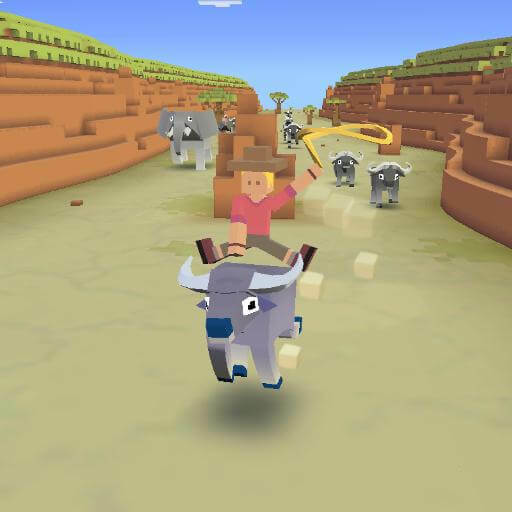 Bored riding the buffalo every time you begin playing Rodeo Stampede? Well, you can choose another animal from the zoo, so the next time the cannon drops your cowboy into the wild, he will ride the chosen animal. To select your starter animal, go to your Sky Zoo and tap on an animal habitat. If you want to ride an ostrich, then tap the Ostrich Habitat. Next, press the “Ride” button to select the animal. Now, whenever you press play, your lasso-equipped hero will ride the ostrich. My favorite animal is the elephant. I choose elephant because he slams anything that comes in his way, (except large rocks). But he also gets annoyed early, so make sure you lasso a nearby animal as soon as the exclamation mark appears as he will buck and quickly throw your cowboy on the ground. Try to ride another animal even before the exclamation mark appears. Tip: You can choose a large starter animal like the elephant if there are objectives like “Smash an X number of buffalos (or any other animal) in one run” or “Destroy an X number of trees”. Each animal habitat provides unique benefits when upgraded. For example: Upgrading the Buffalo habitat to level 3 will make a buffalo charge forward, smashing anything in the way, when you cowboy lands on him. But upgrading the Elephant habitat to level 3 will allow all lassoed elephants to smash through rocks. However, almost all habitats upgraded at level 4 will let you gain 50 percent more ticket money from them. Also, most habitats upgraded to Level 7 will let earn bonus coins by performing certain tasks while riding a lassoed animal. To know upgrade benefits, tap a habitat and then tap the Level number. A new window will show all levels and upgrade benefits. Upgrade all unlocked habitats to level 4. This will help you gain 50 percent more ticket money from each habitat. You will earn bonus coins performing tasks with lassoed animals when you upgrade a habitat to level 7. This is a no-brainer, but taming new animals will increase your sky zoo’s ticket value. Yes the number shown above “Family Pass” will increase with every new animal captured. It could be a totally new animal or an animal that belongs to the same type/breed. Capturing rare animals will increase the overall revenue you will receive from the sky zoo. To get access to more animals, including rare animals, you will have to unlock regions on the map. To do this you will have to complete certain missions that are displayed on the map. On your Sky Zoo screen, tap the Map button to know what missions need to be completed. Once you have completed those missions, you will unlock a new region within the map plus expand your sky zoo to accommodate more animal species. When you tap the “Open for Business” button to let visitors in, you will be given the chance to double the number of families. All you will have to do is watch a short 30-sec video to increase customers. Tap the video icon, watch an advert and double your customers. Turn on Notifications for the next cruise arrival. This way you will be notified when you are not playing the game. When notified, open the app and then press the “Open for Business” button to let tourists visit your zoo. Look for coins scattered on the zoo premises. They appear randomly and will be added to your total income when you tap them. Completing missions in Rodeo Stampede is the best way to earn extra coins. To view a set of missions, tap “Menu” at the top-left corner of the screen and then press the “Missions” button. Make sure you select an animal as per mission requirements. So if the mission tells you to smash 2 Buffalos, then select Elephant as your starter animal and then slam buffalos in the stampede. Once you have completed stampede-specific missions, you will be given an opportunity to double the amount of coins earned from completing them. You can double coins by watching an advert. This offer is shown when you have completed a mission and your cowboy has fallen on the ground. Look for crates while riding an animal. Move your animal towards the crate to smash it and collect coins. Don’t have any missions? Want an extra objective? The mission screen will let you unlock an extra mission by watching an advert. New missions are available every 6 hours. You may turn on notifications so that the game will notify you when they are available. On your Zoo screen, tap the map button to open map. Ship upgrades require players to complete special missions, which can be seen at the bottom of the screen. You can explore + upgrade your ship only after completing those missions listed below the map. However, bear in mind that you will have to spend coins to complete the zoo upgrade procedure. When you upgrade your zoo, you increase its size so that new animal species can be accommodated. A new region is also unlocked, so that you can explore and discover new, and maybe rare, animals.